Welcome to the home page of Sea Scout Ship (S.S.S.) Nautilus (461). We are sponsored by the Zion Mennonite Church of Souderton, Montgomery County, Pennsylvania. We are a relatively new addition to both Scouting and the Sea Scout Fleet and are still in the process of getting our "sea legs," so to speak. About Sea Scouting . . .
Sea Scouts are a division of the Boy Scouts of America and have been existence since 1912. In fact, the first Sea Scout units were founded that year in Boston and Philadelphia. As the name implies, Sea Scouts have a nautical emphasis as opposed to the land-based emphasis of traditional Boy Scout units. That nautical emphasis can take the shape of sailing, canoeing, motor boating, kayaking, scuba diving, or a combination of all of the above. In addition, Sea Scouts can participate in all of the events and activities that are traditionally associated with Boy Scouts. Sea Scouts are an older youth division of the Boy Scouts of America, an equivalent of the Venturing program, and serve youth fourteen (14) to twenty (20) years of age. Youth age thirteen (13) years may become a Sea Scout if the youth has completed the eighth (8th) grade. Like Venturing, Sea Scouts may be co-educational, involving both male and female members. Thus, Sea Scout units may choose to be all male, all female, or co-educational. Naturally, co-educational units are required to have registered adult leaders of both sexes. Boy Scout units are referred to as "Troops," Cub Scout units are referred to as "Packs," Venturing units are referred to as "Crews," while Sea Scout units are called "Ships." A Sea Scout Ship that is large enough to have one or more smaller units is broken up into "Crews," which is the Sea Scout equivalent of a Boy Scout "patrol." One of the hallmarks of both Venture Crews and Sea Scout Ships is that the units are youth-led. The Ship elects its own leaders and plans its own activities. The adult leaders of the Ship are present in an advisory role so as to ensure the safety of the Ship's members and to ensure that the activities of the Ship comport with the guidelines set forth by the Boy Scouts of America. The top youth petty officer of the Ship is called a "Boatswain," which is the equivalent of a Senior Patrol Leader for a Boy Scout Troop or a Crew President for a Venture Crew. The Ship's Purser handles the Ship's finances while the Ship's Storekeeper is in charge of the Ship's equipment. The Boatswain usually has two (2) assistants, called "Boatswain's Mates," who are usually tasked with being responsible for program or administrative functions. The Ship's petty officers are assisted in their duties by the Skipper, Mates and members of the Ship Committee. 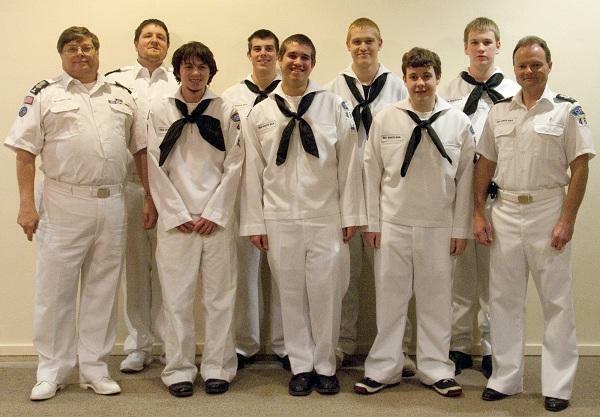 Sea Scout uniforms are similar to those worn by the United States Navy. The dress whites have "Sea Scouts, B.S.A." on the right breast at the level of where a pocket would be and blue Sea Scout insignia are on the flap of the jumper. On the left sleeve is either the community strip or the Council Shoulder Patch with the Ship's number located beneath. The officer's badge of rank is sewn below the Ship's number. The dress blues are the Navy blue jumper and pants but with only two (2) white stripes on the collar and sleeve cuff. The notation "Sea Scouts, B.S.A." in white letters is on the right breast similar to on the white jumper and the Council Shoulder Patch or community strip, Ship number, and officer's badge, if any, are on the left sleeve. For work details and other activities, Sea Scouts use a chambray or denim shirt with blue insignia and blue jeans. Sea Scout adult leaders wear uniforms similar to U.S. Navy officers, but with the distinctive Sea Scout touch that distinguishes Sea Scout leaders from naval officers. Sea Scout Ships are also self-funded. The funds for operating the Ship, planning and going on activities, and acquiring and maintaining equipment is all raised by the Ship. While some funds are raised by dues, the majority of the funds come from fund-raising activities planned, managed, and executed by the Ship's members. In addition to funds necessary for operations of the unit, the Ship also must raise sufficient funds to operate and maintain its boats, which costs include registration, insurance, upkeep and maintenance. Not every Sea Scout Ship has a boat or other vessel, nor does it have to. Some Ships use boats owned and maintained by adult leaders or other persons associated with the Ship or the Ship's sponsor. For special events or cruises, Ships may rent or charter vessels that have capabilities or capacities that a Ship's own vessels lack. About Ship 461 . . .
Ship 461 was chartered by the Boy Scouts of America as of 1 October 2012. While we sponsored by the same organization as is BSA Troop 461 and share some members and adult leaders with the Troop, we are a separate and distinct BSA unit. Ship 461 is part of the General Nash District which serves the North Penn and Souderton Area School Districts. The General Nash District is one of a number of Districts that make up the Cradle of Liberty Council. The Cradle of Liberty Council serves Delaware, Montgomery and Philadelphia Counties. Ship 461 is one of only six (6) Sea Scout Ships in the entire Cradle of Liberty Council. 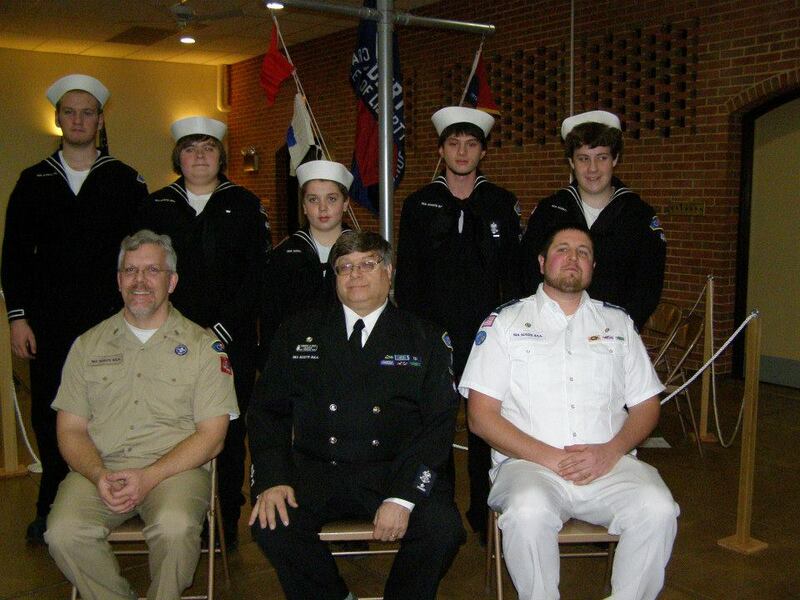 The six Ships in the Cradle of Liberty Council form the Cradle of Liberty Sea Scout Squadron. Neighboring Bucks County and Chester County Councils have only one (1) Sea Scout Ship each. As a result, Squadron, Flotilla, and Regional events take on added significance for Sea Scouts. Ship 461 is also part of the Delaware Valley Flotilla, which is comprised of Sea Scout Ships from Southeastern Pennsylvania, Central and South New Jersey, and Delaware. The Delaware Valley Flotilla is one of five (5) Flotillas that comprise the Northeast Region of the Boy Scouts of America. Ship 461 is sponsored by the Zion Mennonite Church, located at 149 East Cherry Lane in Souderton, Montgomery County, Pennsylvania. We are northwest of the City of Philadelphia in Southeastern Pennsylvania. Our sponsor, Zion Mennonite Church, has sponsored a Boy Scout Troop beginning in 1936 and has sponsored Boy Scout Troop 461, continuously since 1956. In the past, Zion Mennonite Church has sponsored a Cub Scout Pack as well as an Explorer Post. Our sponsor provides us with a place to meet and with a place to store some of our smaller equipment. Our Ship is relatively small at this time, which is not surprising since we are just starting our voyage into Sea Scouting. We drew our initial crew members from the older Scouts of Troop 461 and many of our adult leaders also served with the Troop. We have since expanded our crew and adult leadership membership to individuals outside of that Troop. A few of our Ship crew members are dual registered as Boy Scouts and remain active with their respective Troops as well as with the Ship. Sea Scouts who are dual registered as Boy Scouts, or who have attained the rank of First Class Scout as a Boy Scout before becoming a Sea Scout, may still work towards earning their Eagle Scout Award and earn merit badges as well as qualify for the Scout ranks of Star and Life Scout. A Sea Scout must complete the Eagle Scout requirements prior to the Sea Scout's 18th birthday. Sea Scouts are also eligible to earn all of the Venturing awards, including the Venturing Bronze, Gold, and Silver Awards. Girls may be dual registered as both Sea Scouts and Girl Scouts and continue to work towards their Girl Scout Gold Award while also being Sea Scouts and earning Sea Scout awards. During the summer months, the Ship meets on Sunday afternoons at the Lake Nockamixon Marina at 1200 for a short business meeting and then either sailing, motor boating, or both. During the rest of the year, the Ship meets on Thursday evenings at the Zion Mennonite Church in Souderton beginning at 1930. We meet either in the Fellowship Hall of the church or in the church library, depending upon what other activities are going on at the church that particular evening. Facebook Page Ship-Related Newspaper Articles Why Join Sea Scouts?